Wondershare is a Chinese company that is famous in software and application development. The main focus of the company is to provide the clients with an efficient and easy to use software. 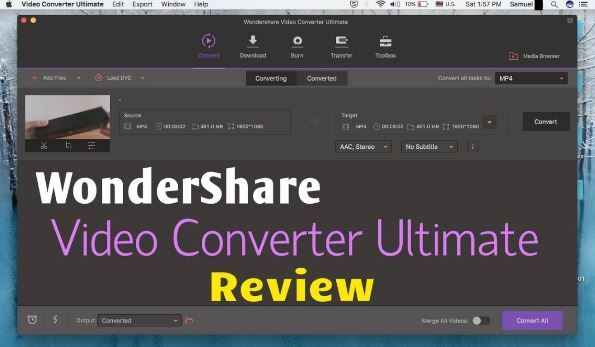 A software developed by Wondershare is Video Converter Ultimate. The software which is capable of converting all type of videos. I was really tired of trying many video converting software but non of them was up to my expectations. Then I tried Video Converter Ultimate which fulfilled all of my needs. Now the question arises Can Video Converter Ultimate can convert videos in any format? Going in the details of the software I came to know that this software is capable of converting videos to any format. All the video formats like mp4, avi, mlv can be converted to any type that is wanted. It was really easy to understand and use the software due to its user friendly layout and display. A non technical person can also use the software easily without any help and guidance. The best feature of the software is that it converts the video in many qualities like 144p, 240p, 360p, 480p etc. This depends on the user that in which he/she wants to convert the file. It not only convert one file at a time, it is capable of converting more than one files at a single time. The speed of the conversion is not affected by converting more files at a single time. Just select the files from the local computer and select the option of converting them to the format that is desired. The converted files are saved in the local computer in a default location which is specified in the settings of the software. The converted files saving location can be changed as desired. Learn more here – How to Convert vob to mp4. Moreover, there is a feature in the software which helps in burning the files directly on the cd. So one can make as many copies of the videos as many are desired. The software is also capable of editing, cropping and trimming the videos. Any type of filter can be added to the videos and can be edited depending on the choice of user. Another feature of this software is gif maker. The software can make gifs of any movie clip or video. With the help of this software, the converted files can directly be transferred to ios or android devices. Just synchronize your device with the software and start the transfer. The trial version of the software is also available on the official website of Wondershare. If one wants to first try the software than he/she can use the trial version of the software and if fully satisfied by the features of the software, it can be purchased from the official website on a low price. I recommend the Video Converter Ultimate to every one who is tired of using other software but didn’t get satisfactory results because I am totally satisfied with the working and the functionality of the software and use it when ever I want to convert any file.